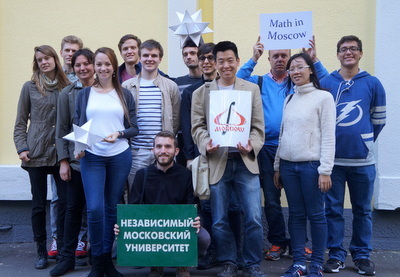 Math in Moscow was a wonderful experience, and one that I will remember for the rest of my life. I learned so much, not only about math, but about Russia (Moscow especially) and my plans for future math study. I’ve gained an amazing appreciation for the beauty of math, and I beleive that everyone should have an experience like this. Thank you so much for all the help and support ! Math in Moscow has been the best experience I have had. I think it is pretty clear how I feel given that I chose to stay an extra semester half-way through the Fall semester ! Moscow changed me as a mathematician, therefore it changed me as a person. A new mathematical culture, a great city and all this in a wonderful country with exceptional people – Very nice ! This program is what you make it. You can learn a great deal of mathematics if you wish; everything you need to succeed is there ! Fully recommend the program. Note: not all Russians have pet polar bears. A very stimulating experience, both mathematically and from a cultural point of view. Moscow is a great city and the IUM a sweet place. I had a great time ! I am so thankful for my experience at IUM. It has contributed hugely to my love and continued pursuit of mathematics. More importantly, however, MiM brought me together with this diverse group of vivid and talented individuals. And that’s the point. A wonderful program and amazing professors. A must attend program !!! There is a lot of time for independent thinking at MIM. The library is stocked with both modern textbooks and an impressive collection of original monographs. This program was perfect. The classes are intense. The average class size was about 5, with more difficult courses were even smaller. They met once a week for 3 hours, and the professors expect a lot of leg work from each student individually. Be warned – this program is not for everybody. A successful student must come mathematically mature enough to learn from books without every detail being fleshed out in class.